When did you start at East Coast? What was your role when you first arrived at the company? I started at East Coast back in April of 2000. My first role was as a call-taker. When I interviewed with Mike I was actually working as an EMT at another company. I must have talked to him in the interview for hours. He told me that he didn't have a position on the road right now, but that he'd like to bring me on. So I started off in the office. I also told him that if my other boss finds out, I’ll get fired. He reassured me, told me not to worry about it, and the rest is history. Now as Operations Manager, how has your job changed and your role expanded? As my years here went by, I learned each position within the company --- how to dispatch, how to do hiring, scheduling, payroll, etc. I was also an EMT in the field. I did field training. I was our QA officer. I've handled IT problems. As I’ve progressed I can now pretty much do any job that's put in front of me. I was taught all of these things directly from Mike, so I know how he wants certain things handled. That’s a privilege not everybody can have. What does a typical day look like for you? What sort of tasks and projects do you do over there? Anything from employee issues, classes, speaking to reps from MIEMSS, conference calls with potential vendors, dispatching, fixing the computers. This morning, for example, I was helping the Risk Manager put together a stair chair. It’s very important in this industry especially to have a “get it done” attitude. If I’ve gotta do something, I’m not handing it off, I’m getting it done myself. What stands out for you as a particularly memorable moment of your time working at East Coast? Seventeen years of memories. Seventeen years of coworkers that became family. It’s hard to choose. There have been so many. One time my partner decided to take the mattress off of a stretcher and sled down a hill. It just so happened to be right in front of one of our hospitals. So the maintenance people called and made a complaint. He said, "I know it wasn’t you. Where is Shannon?" Another thing that really stands out would be our famous company parties. 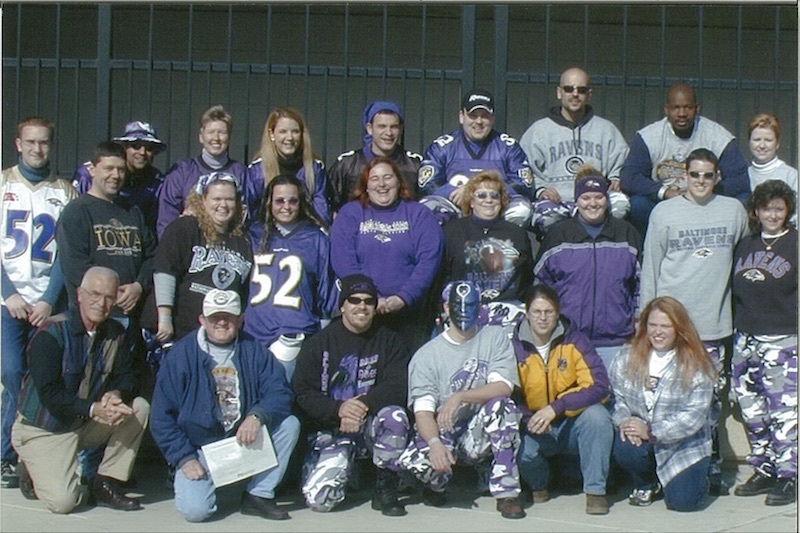 In 2001 Mike took the whole company to the Ravens game and had it catered by Outback Steakhouse. 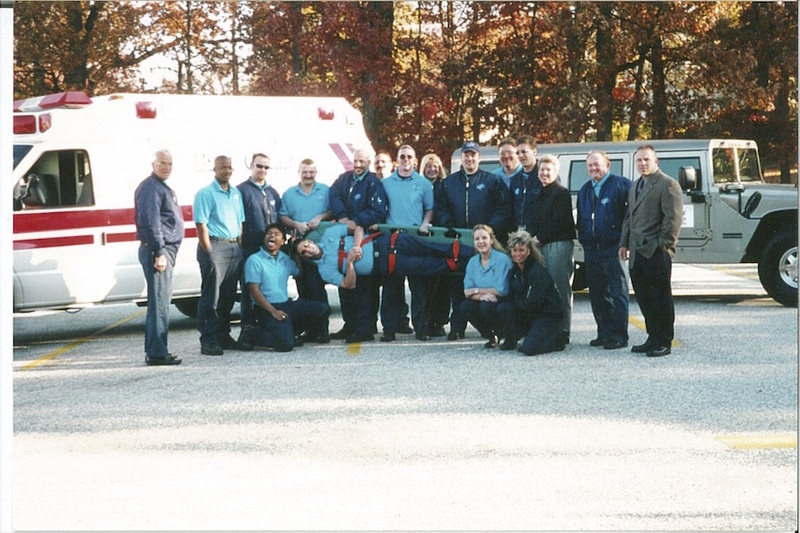 The East Coast Ambulance crew enjoying a Baltimore Ravens game back in 2001. Notice the slick purple and black urban camo pants. Without a doubt, my coworkers. Past and present. I’ve gotten to know some of the most incredible people here, truly some of the most caring and compassionate people I’ve ever met. We’re all friends who look out for each other. Even to this day I keep in touch with everyone. I can remember talking with Mike a few years ago, after one of our former coworkers passed away. I thanked him for creating a company built on values and morals that attracted people who have become some of the best friends I've ever made. Can you describe the company culture at East Coast? I feel like we've established a caring culture from the beginning. Not only with our customers but with each other. Even though the comany has grown a lot over the years, we try hard to maintain that small company personal touch. We also have a very laid back casual environment. We like to laugh and have fun. What’s your advice to someone looking to become an EMT? I think the most important thing is to never stop learning. Take more classes, get more training, have new experiences. Learn from different people. You’re not always going be a hero when the blood is flying, but you may be when the person is crying. Particularly in private ambulance, we do not deal in the "heat of the moment" incidents like 911. You have more time to touch someone in a more personal manner. If you’re not ready to positively impact someone’s life and put aside the nonsense and your own personal drama, then this job isn't right for you. To this day, I still remember interacting with several patients. In one case, when we found out that a patient was going to Gilchrist for hospice, all six of our ambulances at the time went to go visit to make sure we talked to him before he passed. You’re not gonna see other companies doing things like that. It’s a different level of patient interaction here. We actively encourage the personal touch here whereas other companies discourage it. 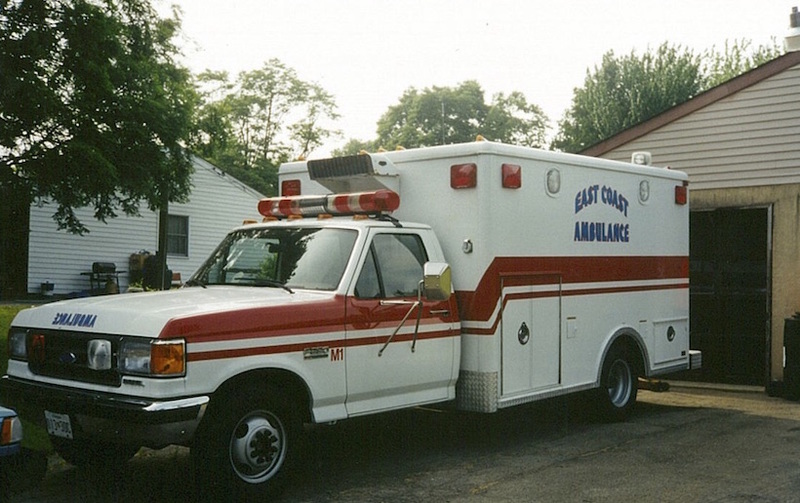 East Coast's first ambulance see here in 1998. How is Mike Rosellini as a boss? Can you tell us a bit about his management style and his personality in general? Mike is a huge motivator --- when I’m finished talking to him, I feel like I could go out and pick up a car. He has the ability to make you believe that you can do anything if you set your mind to it --- because he did that himself. I think he’s fair as far as what’s best for the company and what’s best for the individuals, and there's a lot that other employers could learn from that. He makes you feel like your voice is heard, and your opinion matters and he’s very available. Mike has really become a mentor to me --- in things that I do, work or personal, I look to him for approval. He's helped me through tough times, and I'm very fortunate to have him in my life.